School of Architecture & Design, Victoria University (the Red building, Vivian St) Final Year Degree Show: open for one more week. Massey University School of Art & Design – Exhibition : Blow.08 – open from November 7 – 22, at the old Dominion Museum building. WelTec final year Interior Design – Exhibition : Tangent – from November 7, 2008, at Chaffers Park Gallery. And of course, if you want to take a business card and offer some of this young talent a job, I’m sure they would be most obliged. 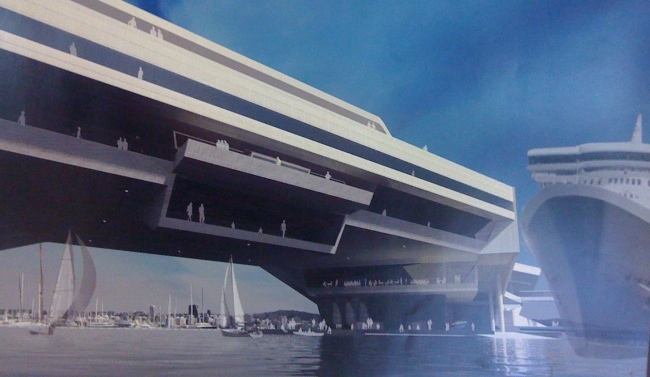 A personal favourite of the Fish, showing that student talent can go far compared to the mainstream architects (and when unfettered by commercial restraints), is Johnson Tong’s scheme for the reworking of the Overseas Passenger Terminal. Some great points: you can see under it, so it won’t disturb the view; you can sail under it, so you can get out to sea quicker; and you can actually tie ocean-going liners up there, which is what the thing is meant to be there for anyway. Now that seems a whole lot better than a rack of apartments for rich yachties! That design gives me the creeps. It looks like the lair of an evil overlord from some science fiction movie. I want to be near the water, not detached from it.